Will fly to Kigoma three times a week, increases Mwanza Nairobi flights from 4 to 14 times a week. Tanzanias leading domestic airline, Precision Air, has announced the resumption of flights to Kigoma and increased frequencies between Mwanza and Nairobi effective from 1st August. According the airline’s Group Managing Director and CEO, Sauda Rajab the Swala tailed airline will be operating three flights a week from its mini hub Mwanza to Kigoma and fourteen flights a week between Mwanza and Nairobi. Ms.Rajab said that Precision Air will be flying to Kigoma on Monday, Wednesday and Friday uplifting passengers from Mwanza Air Port. “We have considered the demand from the market and since we understand the obligations that we have as the biggest domestic Airline in Tanzania, we will resume our operations to Kigoma effective from August 1. We believe the resumption of this route goes hand in hand with government efforts to improve the accessibility to the western region so as to speed up economic development. 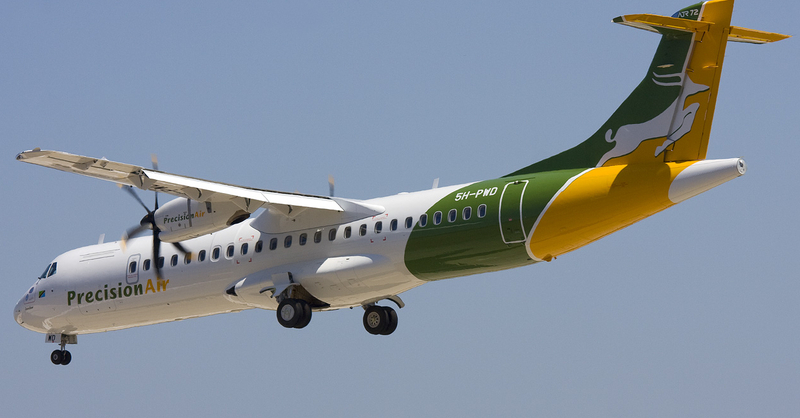 Now through Precision Air, Kigoma is connected to Kilimanjaro, Dar es Salaam, Mwanza, Nairobi, Dubai, Mumbai, Guangzhou, London, Accra, Johannesburg and many other major cities within and out of Africa,” the statement said. At the same time, Precision Air has also announced that it has increased flights between Mwanza and Nairobi from 4 times a week to 14 times a week. According to the statement, the increase is aimed at serving business trips that link Mwanza to all major cities in Africa and beyond including Nairobi, Johannesburg, Accra, Dubai, Mumbai, Bombay, London and Guangzhou. The increase will also start immediately from 1st August. Commenting on the increase Rajab said, Precision Air is committed to deliver superior airline services for the good of the nation and in doing so it will do everything possible to make sure Tanzania is accessible by the international market. “For 21 years we have played a crucial role in facilitating economic growth of our country by enabling leisure and business movements within our country and across the borders, and we have not lost focus of that. Mwanza is our mini hub and also is one of the regions with very vibrant economic activities such as Mining, Fishing and Tourism we believe reliable air service will speed up the development in the region. Business people can now fly from Mwanza to anywhere in the world by Precision Air, ” she added. Precision Air is a local owned Airline operating daily flights to ten (10) domestic and regional destinations. Operating from its main hub Dar es Salaam Precision Air flies to Arusha, Kilimanjaro, Mtwara,Kigoma, Mwanza, Bukoba ,Zanzibar and regionally flies to Nairobi, and Hahaya.